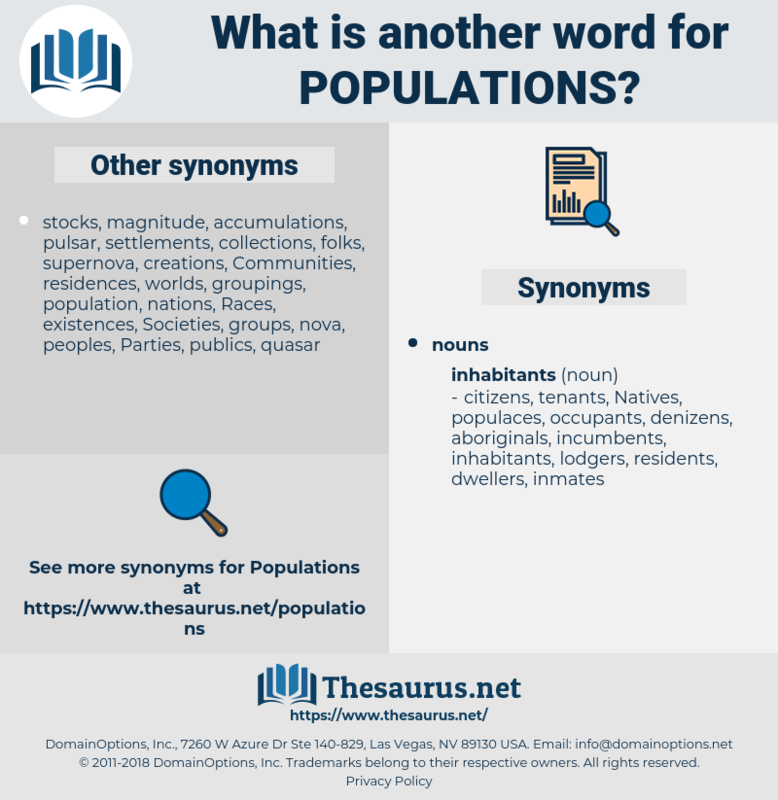 What is another word for Populations? nations, statistics, scotians, audiences, Africans, islanders, forces, beings, men, Koreans, Organizations, groupings, groupes, determinants, clusters, pueblos, bands, teams. 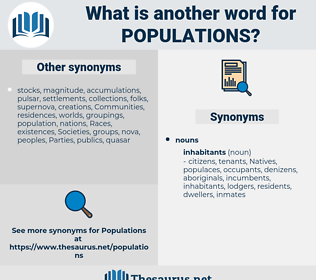 Organizations, grouping, groupings, immigrants, household, groupes, son, vancouver, determinants, american, clusters, pueblos, river, bands, niger, teams, segments, Them, lawrence, kind, Parties, Les, decade. agglomerations, terms, regions, nations, locations, situations, personnel, positions, Municipalities, Concentrations, implications, ethnic, circumstances, years, reservations, applicants, factors, stockpiles, restoration, opinions, audiences, factions, townships, preparation, troops, NATIONALS, occupants, clientele, clienteles, sections, Displaced, Households, Adults, Environments, accessions, estimates, Migrants, purposes, collections, Animals, caseloads, provinces, Associations, Europeans, Cities, Quantities, IMPACTS, locals, millions, landscapes, pools, Societies, manitoba, Respondents, genetics, samples, participants, values, personnes, civilians, claimants, stakeholders, flocks, gatherings, Plants, existing, inmates, patterns, Resources, posts, sizes, declines, Americans, Inventories, names, Colonies, cattle, subspecies, islanders, livelihoods, effects, outcomes, tourists, files, prisoners, dwellings, cameroonians, backgrounds, forces, Tribes, gangs, holdings, individuals, Ecosystems, IDUS, requirements, Countries, rates, targets, reserves, specimens, peasants, Areas, villagers, services, clearees, Refugees, complement, crowds, Companies, Assemblies, settings, passengers, Activities, candidates, Mouths, outlets, herds, Clients, customers, ways, Records, Categories, occurrences, threats, Classes, instances, levels, Fisheries, settlers, Risks, networks, sites, Surveys, Forests, lakes, Races, provenances, Rallies, sectors, STIS, cottages, needs, statements, sources, Diseases, Squatters, blocs, types, media, deaths, insiders, circles, beings, assemblages, venues, men, Ones, others, WEBSITES, methods, caucuses, mechanisms, practices, kits, places, hiv, systems, protectors, lodgers, employees, VOTES, users, stands, data, cabins, farmers, Studies, kids, sets, sides, modes, seekers, figures, complexes, packages, Efforts, number, views, -rrb-, cases, exchanges, members, officers, 2006, compounds, #, Bodies, Remedies, ;, victims, Organizations, groupings, name, immigrants, villages, birds, groupes, clusters, pueblos, bands, teams, segments, Parties. adapted, affected, conducted, known, called, found, Created. village, villages, Constituencies, town, towns, masses, tenants, dwellers, demography. indigenous, reproduction, displacement, enrolments, localities, constituents, Habitats, Minorities, habitants, settlements, Lives, Fishes, subgroups, publics, admissions, ages, Constituencies, towns, Demographics, masses, tenants, dwellers. The costly habit of living on prey, which does not favour large populations, was maintained for the feeble larvae; but the vigorous adult broke herself of it to lead an easier and more prosperous life. It gives expression to the growing conviction that the life of great cities is too artificial and specialised to permit of a healthy all - round development of their populations. platinum, play down, pull down, polyodon, plutonian, paladin, polythene, platan, playtime, papilledema, palladian, pluton, pollution, palatine, platoon, pullulation, plethodon, Piltdown Man, palliation, pallidum, plutonium 239, palladium, plutonium, platen.